Jameson delivers an exceptional lesson experience and ranks in the top 15% of our teachers nationwide. Taught group classes and individual lessons to students in the music department. Taught voice and Alexander Technique lessons to students in the Preparatory school and Continuing Education departments. The American Society for the Alexander Technique (AmSAT) is the largest professional association of certified Alexander Technique teachers in the United States.The requirements for AmSAT teacher certification are specified in AmSAT's Bylaws and include the completion of 1,600 hours of training over a minimum of three years at an AmSAT-approved Teacher Training Course. AmSAT Teacher Training Courses maintain a five-to-one student/teacher ratio. One of my favorite students--my daughter. Overall, Jameson is wonderful. He is very personable, honest, knowledgeable in his field, and patient. You will definitely see improvement! He makes sure you understand the best ways to make your voice sound amazing with least amount of effort. I'm an inexperienced singer and Jameson is great with me. I am learning things at every lesson that I can apply on my own to help me reach my goal of being a competent member of a choir. It's never too late to do something you've always wanted to try! Jameson has improved my voice 100 fold! I am a professional singer from a different genre. Learning opera with Jameson has improved the quality of my voice immensely. Even when I am not singing opera, my voice has more power and resonance in all areas of singing because of the work he has done with me. I am so pleased and so impressed with his skill. If you're thinking about lessons with Jameson, DO IT! Beyond my expectation. Exceptional instruction. Inviting environment. Great vibes. Very Knowledgable in his content area as well as other fields. Awesome class!! Can't wait to have my next one! Jameson is an exceptional singer and teacher. He is kind and patient in lessons and wants to make sure you understand what he is teaching. Not only does he go over the notes and rhythms of a song, he also goes over the meaning and emotions of the piece to help you understand and perform the piece. Jameson has been patient with me in the few lessons I've had with him so far. He's very knowledgeable and understanding, so I felt no need to be ashamed when I make mistakes or sometimes sound funny. It helps that he's friendly and approachable. The lessons are purposeful and insightful. I like how he allows me to ask questions and he helps me understand mechanics that I've never learned before. I've sung in a few church choirs for many years on and off without any vocal training. I've only ever sung for just the love of singing, so I've collected some bad habits that were never addressed until now. It didn't take long for him to develop a gameplan for me and figure out how he's gonna get me right on track. continue with my lessons with him because I'd like to see where he can help me take my voice. Definitely top-notch instruction from a pro here, so for me, it's money well-spent. Jameson's knowledge and instruction go well beyond the physical mechanics of singing. His lessons bring you to the mental approach to singing and performing. He somehow makes the abstract tangible, at least in so far as it can be applied in a real way. Lastly, I don't think I ever had a lesson where we did not share some laughter. I worked with Jameson for a year and a half, and it transformed singing from a source of self-doubt into something I do with confidence and joy. The Alexander technique works wonders for really being able to understand how to use every part of your body to find the best sound. Lessons were always comfortable, fun, and exciting as I learned new ways to feel comfortable throughout my entire range. I seriously envy his Texan students! Jameson is a perfect teacher…superlatively knowledgeable, experienced, talented, effective, professional, understanding, encouraging, friendly, and fun. I’m an electrical engineering graduate student. In love with (listening to) classical voice and musical theatre, and desperate to learn to sing, but with no applicable musical intuition or experience, I began taking lessons with Jameson early last year. Whenever I have a question (and believe me, I ask a LOT of questions), Jameson is ready with a comprehensive, informed answer. Whenever I struggle with a particular exercise or skill or phrase, Jameson is ready with an effective remedy. When I sense (or he senses) that something doesn't feel or sound quite right, he will tell me which senses I should pay attention to and which senses might lead me astray if I focus on them while singing. He has always worked hard and effectively to teach me how to put and keep my mind and body in the proper frame for singing (regardless of the state I'm in when I enter the studio), sometimes by introducing Alexander Technique exercises and principles, informed by human anatomy. When we work on a piece, starting with the bare melody, Jameson guides me through deeper and deeper levels of understanding and connection with the piece so that my performance continually improves and becomes progressively more organic. Jameson never bends me toward a particular sound; he helps make my experience and my sound intensely personal, while always improving the quality of that sound and promoting a healthy singing style. Thanks to Jameson, I’m now well on my way. I hear and appreciate and love music as never before. As for singing…I am delighted beyond words by my initial development of and persistent improvement in tone quality, musical understanding, range, control, basic ability, consistency, and confidence. In my life so far, I have known many teachers (of many things), among whom a very, very tiny number change everything forever. Beyond a shadow of a doubt, Jameson is one of them. Passionate, effective and thoughtful teacher. 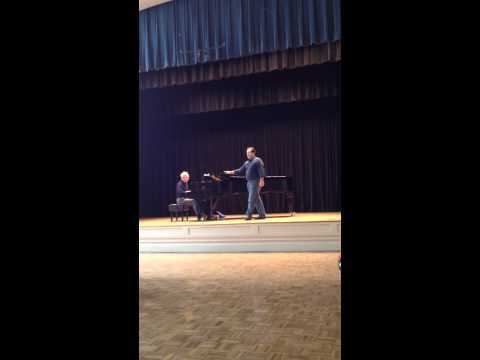 I attended an Alexander Technique workshop Jameson co-hosted at the New England Conservatory and recently began personal lessons on AT and voice lessons with him. Jameson is passionate about teaching and is able to teach students at different levels of ability. I would highly recommend Jameson for singing and Alexander Technique lessons. I couldn't ask for a better teacher. I have enjoyed singing so much more since starting lessons less than a year ago. Jameson has taught me to get more out of my voice with less effort. His lessons are professional, packed with information, and fun. He meets his students where they are in terms of their musical abilities. I have sang in quite a few choirs, musicals, and small acapella groups, but hadn't sang for quite a few years. He has successfully drawn my voice back out and helped me break several bad habits. I intended to only take a few lessons from Jameson, but now don't have any intention of stopping lessons anytime soon. Now even my husband has taken a few singing lessons from him to tune up his voice before singing at a few weddings this summer. I would recommend Jameson as a teacher for anyone looking to achieve any goal with their singing! He's a wonderful teacher. I started working with Jameson well over a year and a half ago. Jameson has helped me to find my voice, quite literally. Through our weekly sessions he helped me find a deep, rich, bass voice that I didn't know I had. Using the Alexander technique, my posture improved and the richness of my voice came out. I have so appreciated his patience, kindness, and ability to give me space as I figured out how my voice worked. I would HIGHLY recommend Jameson as an intuitive teacher who works at the student's pace. I have learned so much from him. I don't know what I expected when I signed up for singing lessons with Jameson through TakeLessons. I was looking to improve my upper range, maybe get a better understanding of breath control and tonality. And, boy oh boy, did he help me in those areas. Plus the Alexander Technique active relaxation exercises help me with chronic neck pain! Jameson is extremely knowledgeable, and he immediately identifies areas for improvement to target. I feel like the lessons are customized for my particualar vocal needs, not to mention that the lessons are super fun. Jameson is the reason that I have improved on my singing. He really helps to improve singing range, especially in head voice and the higher pitches. I definitely feel more confident in my singing. Jameson really makes a singer make a song his or her own by the way that he incorporates feelings and actions. The Alexander Technique really helps in singing and in every day activities. I am having fun working with Jameson. I was looking for a non competitive, friendly teaching environment, with the right level of discipline. Jameson's classes and style are very balance, and I can hear my improvements. I recommend this teacher for anyone who is willing to discover its voice and improve within its own rythme and ability. Very Fun & Knows what he's doing! I've only had a couple lessons so far & i am impressed at what my voice can do! He's very patient & understanding, doesnt matter what level you're at, he'll work with you & help you find your strengths and weaknesses. I've enjoyed every lesson so far & i lool forward to learning more each time! Wonderful at helping me enjoy singing with confidence! Working with Jameson, I could see improvement in my singing after my first lesson, when he taught me some very simple techniques for better breathing. He's endlessly enthusiastic and reassuring, and I feel much, *much* more confident and less anxious than I did five months ago-- now, when I stand up to sing, I feel like I know what I'm doing enough not to worry about how it'll sound. His Alexander technique teaching is great for helping me understand how to use *all* of myself in singing, from head to heels. My friends and family have noticed excellent changes in my voice. I've recommended him to everyone I know who's looking for lessons! Jameson's helpful pointers, positive feedback and easy-going attitude and sense of humor make it really easy to make progress and feel good about lessons and about singing in general. Jameson was a great music teacher who I would recommend to anyone who is just starting singing or is experienced but would like to further hone their skills. I learned more about technique after a few lessons with him than I did in two years of chorus at school. He has a flexible schedule for students and teaches at a convenient location right near the train station. He helped me to prepare for a college audition which I would not have passed without his help. Again, I fully recommend him to anyone looking to improve their singing skills. I have had a great time working with Jameson. He has provided me with so many different tips that have helped to give my voice some more energy. I can't believe how much he has helped me to improve! I can't wait to see what the future results will be for my voice! I am having a great experience with Jameson! His instruction is helping me increase my range and his tips have helped my posture so much! In only 5-6 sessions my singing voice is so much richer. He's also incredibly warm and friendly which is very important to me. I never thought how the Alexander Technique can help improve my singing. His specialty, years of experience in singing and teaching makes me aware that I am in good hands. Jameson has helped me start to find a tone in my voice that I honestly did not know existed. Jameson is a wonderful teacher. From the first few lessons of working for him, my singing improved. After a year of working with him, I couldn't be happier with the results. I highly recommend Jameson to people of all levels who would like to improve their singing.